There are many lenses and perspectives through which to look at economic development. In this note, the process known as the demographic dividend is conceptualized in a Chilean context. The analysis shows how Chile during the past two decades has benefited from the dividend proxied by the increasingly favorable trend in overall age structure of the society. By some measures Chile’s demographic dividend is ending in these very years, but by adapting a slightly broader definition of the optimal working age and subsequent productivity profile it appears that Chile still finds itself in the proverbial sweet spot. Coupled with the favorable windfall from copper exports and the subsequent transformation of this into an unprecedented net wealth position of Chile’s public accounts, the economy looks on a very solid footing to face whatever travails which might come next. As for the immediate outlook for Chile it appears that a slowdown is steadily rolling its way in. Tightening credit supply by financial institutions, a hawkish central and deterioration in terms of trade (forecast by the central bank) are all factors to be taken into account. Finally, a slowdown in the economy’s rate of job creation rate suggests that the slowdown may now finally be set to take hold in the immediate future. Consequently, headline GDP is expected to moderate somewhat in H02 2008 and H01 2009. Chile has benefited immensely from the global boom in commodities and specifically the surging price of copper. 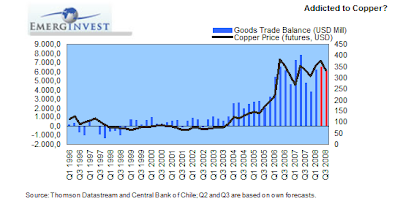 The revenues from copper exports have kept Chile’s external trade balance solidly in the black for he past 4 years and the subsequent windfall have provided Chile with bulging coffers in the treasury. Official forecasts suggest that this may now be about to end, but it needs to be stressed that as long as copper prices stay in the region of the current level and absent a complete slump in demand, the trade balance should continue to provide a sound counter balance to the negative income account. As is the case in most other emerging economies the Chilean central bank is strongly focused on an inflation rate currently running well above its 3% target (9.5% in July). With this in mind, it is reasonable to expect that the central bank will continue to raise to a policy rate of 9.5% before the end of 2008. Coupled with the recent suggestion by official advisors that the central bank abandon open market operations to manipulate the Peso, the hawkish position should benefit the Peso in H02 2008. One risk to this call would be a significant spike in risk aversion that could lead to an emerging economy wide capital flight. The Chilean economy continued to expand in Q1 albeit at a slightly lower pace than in 2007. GDP growth expanded 3 % on the year and 1.4% q-o-q where the latter figure translates into an annualized growth rate of 5.6%. Not many forecasters, official as well as commercial, expect this figure to hold however. Morgan Stanley recently revised its 2008 GDP estimate downwards from 4.3% to 3.8% whereas the central bank is more sanguine in their bid of 4.0 to 5.0% for 2008. Chile expanded 5% in 2007. On the demand side the expansion in Q1 was largely driven by gross fixed capital formation. For 2008 the central bank is predicting investments to increase by 13% driven, to a great extent, by energy and mining related capex. Consumption however grew at an overall slower pace than 2007 and is not expected to top a 5% growth rate in 2008. As for government spending, the central predicts that the formal rule established in light of the recent copper bonanza (see below) will persist in 2008 where the public surplus is expected to clock in at 0.5% of GDP. Despite the apparent solid performance figures signs are emerging to indicate the Chilean economy may be slowing. This possibility is hinted at in the recent central bank monetary report where a decidedly cautious tone is presented. The central bank ascribes a relatively high downside to the effects from incoming inflation pressures as well as negative hydrological conditions which are tantamount to the energy supply in Chile. One sign that the economy may be entering a softer patch comes from industrial production figures where production fell in both April and May at -2.8% and -0.9% (m-o-m) respectively. If we turn to yearly figures, the recent months have been more volatile than the stable levels observed in 2006 and 2007 but the trend is inexorably one of decline. Over the first six months of 2008 industrial production averaged a 4.2% increase which compares to an average of 5.2% in the corresponding months of 2007. Domestic demand as proxied by sales of consumer goods also shows signs of decline in growth rates. In the first half of 2008 sales averaged a monthly (y-o-y) growth rate of 4.2% which compares with 7.7% in H01 2007 and 5.0% in H02 2007. An educated guess suggests that domestic demand will grow in the region of 3.5% to 4% in 2008 which must be compared to a corresponding growth rate of 6.3% in 2007. Clearly, this does not signify a crash, but more so a moderate slowdown in line with global fundamentals. Morgan Stanley’s in-house Chile analyst Luis Arcantales also weighs in on the situation of the consumer. Arcantales notes three headwinds in the form of rising inflation, tightening credit standards, and a slower job creation. According to Arcantales the banking sector in Chile has acted swiftly, and in essence proactively, in the face of the global outlook where tighter credit standards seem certain to be a part of the equation. In the second quarter of 2008 44% of banks consequently reported that they have tightened credit standards. If we add the fact that the central bank of Chile is still in the midst of a hiking cycle, which so far as taken the rate to 7.75% from 5% in June 2007, it is clear that demand and supply for consumer credit is likely to fall further. With respect to labour market dynamics employment continued to expand briskly in Q1 2008, but seems to have slown down somewhat in Q2. Out of an estimated 7.186.130 people in the labour force 6.583.130 were in employment which translates into an unemployment rate of 8.4% (603.000). In Q2 the number of people in employment furthermore decreased slightly 0.3%. Compared to Q2 2007 the unemployment rate increased 1.5% and compared to Q1 the corresponding figure was 0.4%. This coupled with a hawkish central bank and a deteriorating credit environment for consumers suggests that Chile may be heading down a notch a two when it comes to top line economic growth. As a part of the general slowdown in economic activity the lingering increase in inflation definitely seems to be the most pre-occupying threat from the point of view of policy makers and sell side research. JPMorgan suggests that Chile may be set to enter a stagflationary phase as growth nudges below trend at the same time as inflation remains elevated. JPMorgan furthermore anticipates the central bank to move in strongly to counter the inflation trends which will further put pressure on Chile’s economy. Unlike in other economies inflation pressures do not seem to come as quickly on the back of easing commodity pressures as first expected. In July, inflation rose to an annual rate of 9.5% and even though the central bank opted to raise interest rates 50 basis points on the 14th of August the real interest rate is still negative. This may not in itself be a solid policy gauge since, as we learned above, credit already seems to be tightening considerably due to restraints on the part of a proactive financial services sector. At this point, inflation forecasts for 2008 are hovering between 8-9% and with a formal target of 3% we can expect the central bank to continue with the rating cycle. The central – confident in its investment strategy, forecasts that inflation should fall towards its 3% target in Q2 2009. We are reluctant to look this far ahead but concur that inflation is set to remain high for the rest of 2008. This, in turn, will in turn keep the central focused on inflation. It is thus perfectly possible that we see a central bank refi rate of around 9.5% before 2008 is out. One important factor here is also the Peso where the central bank has recently been engaged in open market operations to stem the flow of appreciation against the USD and in fact to maintain what has been a steady depreciation since April. Given the inflationary tendencies and their persistence advisors close to the central bank have explicitly suggested that such open market operations be abandoned due to the threat from inflation. Given the recent and new found strength of the US dollar it is difficult to say whether the Peso will be flattered too much by the central bank’s hawkish stance (against the USD that is). However, it is reasonable to expect we think that the Peso will appreciate moderately provided that the central bank decides to stop its open market operations. At the end of June the Peso marked a 10 year low against the Dollar, a value we feel should fall slightly in H02 given the continuing hawkish position by the central bank. Perhaps the most important aspect of the Chilean economy since the advent of the 21st century has been the extraordinary windfall from copper production and exports. According to most estimates Chile alone accounts for one third of the world’s copper production and in light of the relentless upward March of copper prices Chile has seen its goods trade surplus swell accordingly. In formal terms, the so-called copper Bonanza began in 2004 and has continued un-abated up until this point. Given the recent decrease, across the board, in basic commodities the goods trade balance seems set to deteriorate but only slightly as far as goes 2008. In Q1 the goods balance stood at 6231 mill USD which is up considerably from the previous quarter. In Q2 and Q3 the goods balance is forecast  to take the value of 6555 and 6147 mill USD respectively where the trend is more important than the point forecast itself. However, the external balance is not only about tangible goods. Consequently, and while a positive trade balance is still keeping the overall current account in surplus, a negative income balance is beginning to pull the trend down. Add to this that the trade balance in 2008 looks set to be weaker than in 2007 the current account could very well swing into negative in 2009 which would be the first time in five years. In fact, the central bank is predicting the current account to swing into negative already in 2008. This seems a quite bearish forecast but much will depend on the rate of import growth which is the major determining factor in the forecast. As such, the central bank forecasts the goods balance to deteriorate to 17.000 mill USD in 2008 from 23.653 mill USD in 2007. Clearly, this would be at odds with the model deployed above but given its high degree of prediction error in terms of point forecasts, the central bank’s forecast should not be explicitly challenged at this point. Much more important than the immediate outlook of the external books is, however, the way Chile has chosen to manage the recent years’ copper bonanza. One crucial aspect to note is then the extent to which Chile has maintained fiscal discipline in the face of the surging commodity boom. In numbers, Chile has consequently aimed at an annual fiscal surplus of 0.5%/GDP to act as a counterweight to the incoming copper revenues. In more traditional economic terms one could also see this as a proactive attempt to avoid that Chile fall under the yoke of a Dutch disease type correction. So far, Chile has honed up to its intentions. Between 1996 and 2006, Chile’s public balance averaged 1.5% of GDP a position much better than that held by its peers in East Asia and Latin America. From 2005 to 2007 the structural surplus as a percentage of GDP was 1% and is expected to 0.5% in 2008. However, the pure fiscal surplus, in 2008, as a percentage share of GDP stood at 8.1% which is quite extraordinary on any measure. In 2008 the corresponding figure is set to decline to 4.8% which still represents a solid cushion. Apart from handing Chile the highest sovereign debt rating in Latin America it also prompted Luis Arcantales recently to dub Chile the real thing referring to the fact that Chile, unlike its Latin American peers, has chosen to build up a structural fiscal war chest rather than one of foreign FX reserves. Ultimately however and a in a context of global liquidity the bottom line remains much the same. Consequently, Chile’s treasury recently laid out a plan on how to construct an optimal global portfolio from which the copper windfall could be transferred into financial assets. Through the so-called Economic & Social Stabilization Fund (FEES), Chile plans to put a substantial amount of its savings into equities and corporate bonds. Thus, and quite in line with other sovereign investment vehicles (SWFs), so will Chile’s savings also be going for yield, even in a situation where the government is a net creditor with outstanding debt at about -11% of GDP. This is how our model performs in a post mortem perspective. In general, the fit in terms of point forecasts is not that good, but the fitted trend is very close to the actual movements with a correlation coefficient of 0.92. From a standard model selection criteria point of view the model performs marginally better at predicting the trade balance than a random walk model although it is considerably better to predict the time series in changes. The model is consequently formally built upon variables in changes to correct for stationarity problems. Originally published at Global Economy Matters on Oct 5, 2008 and reproduced here with the author’s permission. Growth in Chile: Feeling the Pinch of a Global Slowdown? One Response to "Chile’s Economy In Perspective – October 2008"